A few Saturdays ago, as my husband and I were roaming the Arcata Farmers' Market, we met a neighbor. She asked whether I was buying zucchini from the stall in front of us. I had in fact written in a recent Table Talk ("Zucchini Season," July 7) that I buy zucchini by default every time I go to the Farmers' Market. I had to admit that I had fallen behind in my zucchini consumption schedule, and as a result had a substantial amount of the squash in my fridge. I was therefore looking for broccoli to make a soup -- with zucchini. 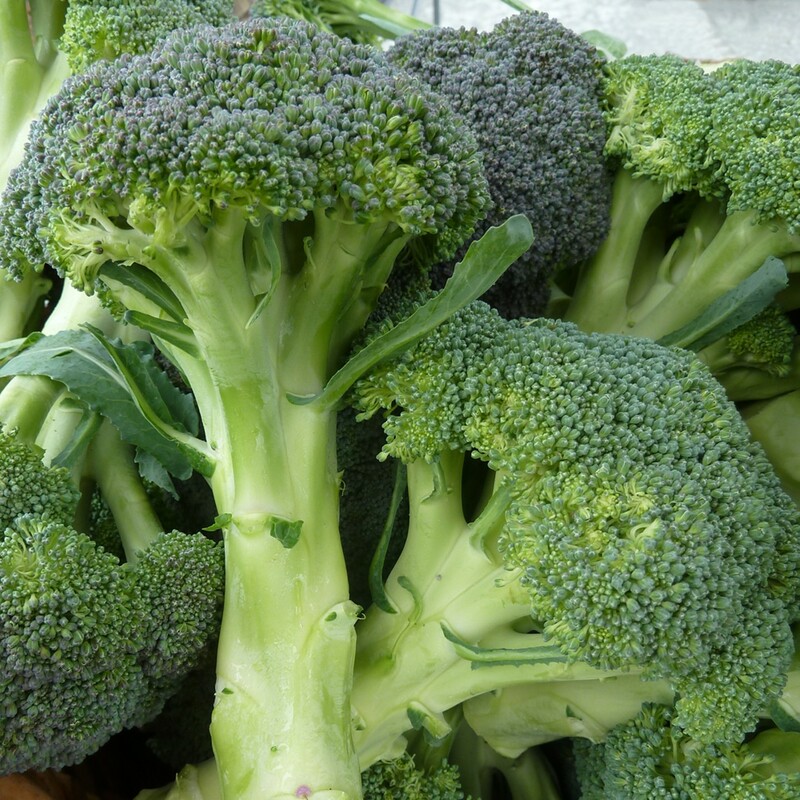 Let's leave zucchini aside for a moment and focus on vegetable superstar broccoli, which shares with zucchini the Italian origin of the name. I am aware that publicly stating my partiality for broccoli will not make me a hero in some people's eyes, but as a matter of fact, I like broccoli a lot. And when vegetables are newly picked and grown with TLC, I like to dress them lightly so their flavor can shine. In my recipe for Simple Broccoli Salad, I don't give precise quantities: Every ingredient is to taste, and the quantities also depend on the amount of broccoli you prepare. In addition, I like steamed broccoli soft, but I know that not everybody shares my taste. And I use a lot of vinegar in my salad dressing, a preference I cannot assume other people have. On that recent market day, I purchased broccoli and made the soup I had in mind. Preparing hot soup in the summer may seem strange, but summer evenings along the coast often make one dream of a bowl of soul-warming soup. And in any case, I like soups any time of the year. Soups allow you to be creative with whatever ingredients you have available, and you get a final product that is more interesting than the sum of its parts. When I roast a chicken, bones and trimmings go into making a light stock (and so do some vegetable trimmings). The recipe for light chicken stock I sort of follow is from Julia Child's Julia's Kitchen Wisdom. Quart-size tubs originally holding yogurt make perfect freezer containers. Having a stash of homemade stock allows me to make flavorful soups at short notice. Back to today's green soup: broccoli, zucchini, red onion (either the round or the torpedo kind), a leek and fresh basil are the ingredients you'll need. The result is a mild-flavored soup that you can enjoy as is, or enrich in various ways, for example with cheese (freshly grated or crumbled, depending on the kind of cheese you choose) and/or cooked grains (like hull-less barley or quinoa). If you don't add grains to the soup, accompany it with some nice bread -- maybe even homemade. The recipe makes a nice amount of soup, so you may decide to freeze some of it for later consumption (those empty yogurt containers come handy again), or you may halve the quantities. Final note: During my conversation with our neighbor, she asked me whether I've ever made stuffed zucchini. I haven't. I then thought that I would like to work on a recipe for stuffed zucchini, so, before I left the market that day, I bought some zucchini to start my experiments. QED. Spread hazelnuts in a single layer on a baking sheet and place in the middle of the oven for 10-12 minutes, or until hazelnuts are lightly colored and skins are blistered. Wrap hazelnuts in a kitchen towel and let steam for a minute, then rub in the towel to remove loose skins (not all of them will come off, which is fine). Let cool completely. Wash and cut broccoli head(s) into florets. Halve large florets lengthwise to get smaller pieces. Peel the tough outer layer of stalks, quarter if very thick, and cut crosswise into short lengths. Steam florets and stalk pieces to desired softness. Remove from steam basket and let cool in a salad bowl. In a small jar, measure olive oil, balsamic vinegar and salt to taste. Screw on the lid and shake well. Distribute some of the vinaigrette on the broccoli and toss gently. Crush hazelnuts with mortar and pestle and sprinkle on the broccoli. Serve with additional vinaigrette on the side. Wash broccoli and cut heads into florets. Halve large florets lengthwise to get pieces of comparable size. Peel the tough outer layer of the stalk(s), quarter if very thick, and cut crosswise into short lengths. Cut the leek in half lengthwise, slice crosswise and wash carefully to remove any grit. Warm up some olive oil in a soup pot and add diced onion and leeks. Stir to coat, and after a couple of minutes, cover pot and let vegetables cook for 8 minutes, stirring occasionally to prevent sticking. Add broccoli, zucchini and stock, then enough water so that the vegetables are almost, but not completely, covered: You should still see a bit sticking out of the liquid. Cover pot, bring to a boil, then lower heat and cook gently until the vegetables are soft (check a piece of broccoli to verify the tenderness). When done, remove from heat and add basil. Purée in food processor or using an immersion blender. Serve hot, as is, or with accompaniments of choice.